I have been to Dusseldorf, Germany quite a few times and I almost even moved there recently. 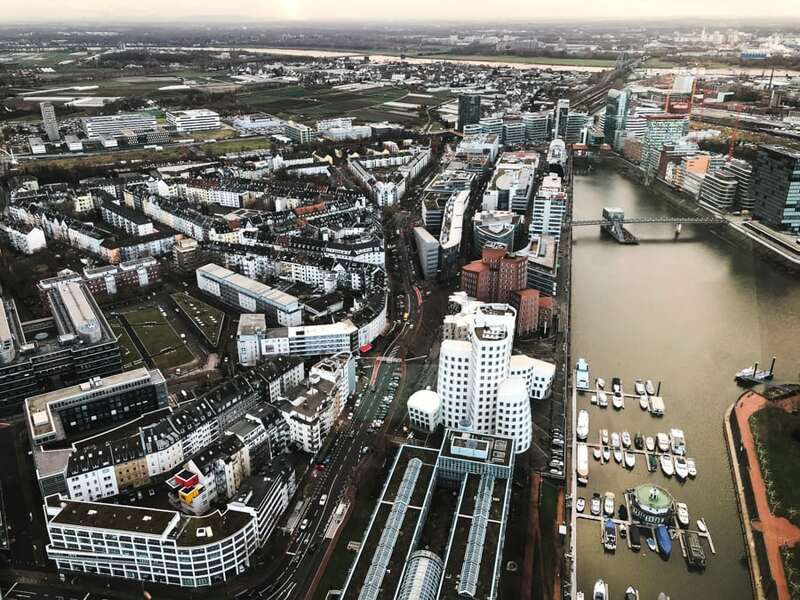 The German city is often overlooked in favor of Berlin, Hamburg, or even nearby Cologne, but if you take the time to get to know Dusseldorf a bit, you will likely find that it is a hip and exciting place all in its own. This is a guide of some awesome things to do in Dusseldorf, Germany. 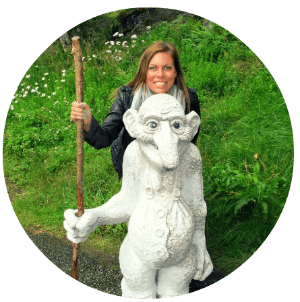 If you know of what to do in Dusseldorf and it is not on this list, please drop it in the comments! I first went to Dusseldorf back in 2016, which seems like just yesterday. I decided to make it my birthday trip and go solo for the day. While there, I got the bad news that my visa paperwork was not processing through, therefore tainting the trip immensely. I walked around and plotted a move to Ukraine (which later ended up being Kazakhstan, but that’s not the point). I didn’t connect well with Dusseldorf. Many trips later, some good and some bad, and a recent overnight trip there, I am finally starting to feel Dusseldorf’s elusive and subtle vibe. I always considered myself a Cologne girl. I like the party and a bit of grittiness. Dusseldorf is organized and pretty. But, I finally get it. This list of things to do in Dusseldorf is a mixture of popular things to do and some that are a bit more off the path. I hope you enjoy! 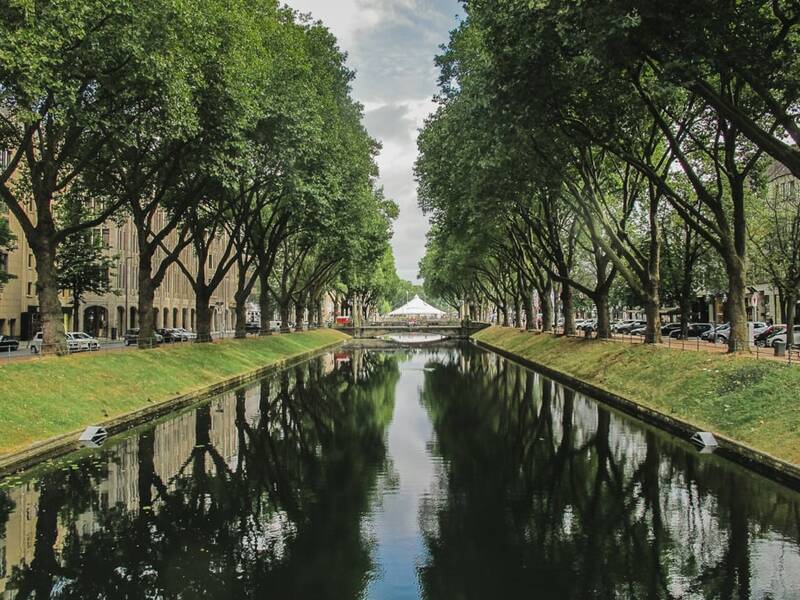 Dusseldorf is a city brimming with creatives and the city’s dedication to its museums is proof of that. The Kunstsammlung Nordrhein-Westfalen is dedicated to modern art and they have it split into two separate buildings, the K20 and K21. They are in different areas of the city and both house permanent and temporary exhibitions. There is work from both German and international artists and you can even see work from Picasso inside. The K20 and K21 are so special because they have a lot of interactive exhibits and it can turn anyone into an art enthusiast. 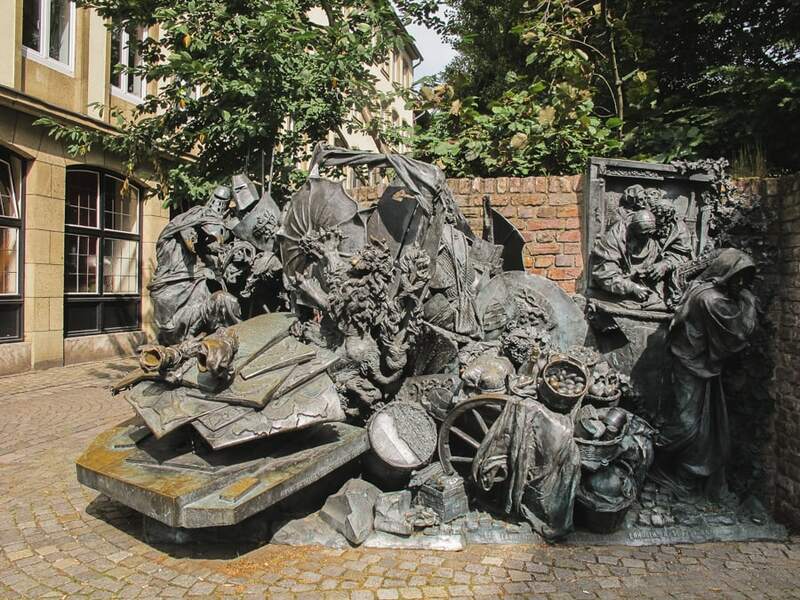 Visiting these museums is an essential thing to do in Dusseldorf. 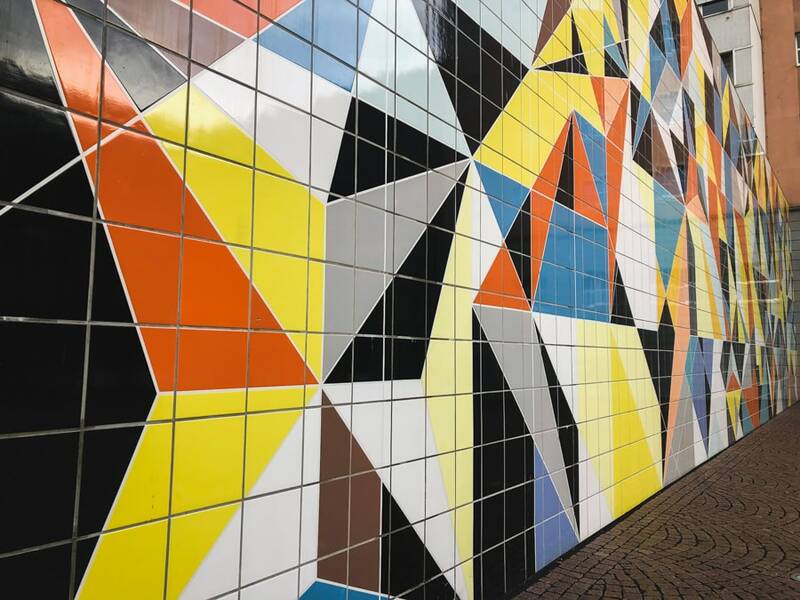 In the middle of Dusseldorf and hidden in a quiet alley, you will find the ‘Hornet’, a large, ceramic-tiled piece of artwork on the side of a building. This was created and painted by Sarah Morris, an American artist and filmmaker. The concept was meant to look like origami and was an interpretation of how she sees urban architecture. The reason it was placed where it is located was that of the challenging spatial situation at Paul-Klee-Platz. The artwork is stunning and it is the perfect backdrop for photos and portraits. You can locate it at Paul-Klee-Platz behind the K20. 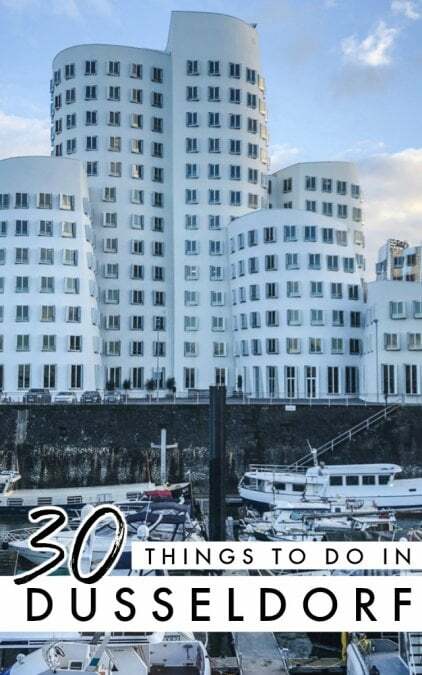 Renowned architect Frank O. Gehry from the US designed what eventually has become an iconic Dusseldorf symbol. 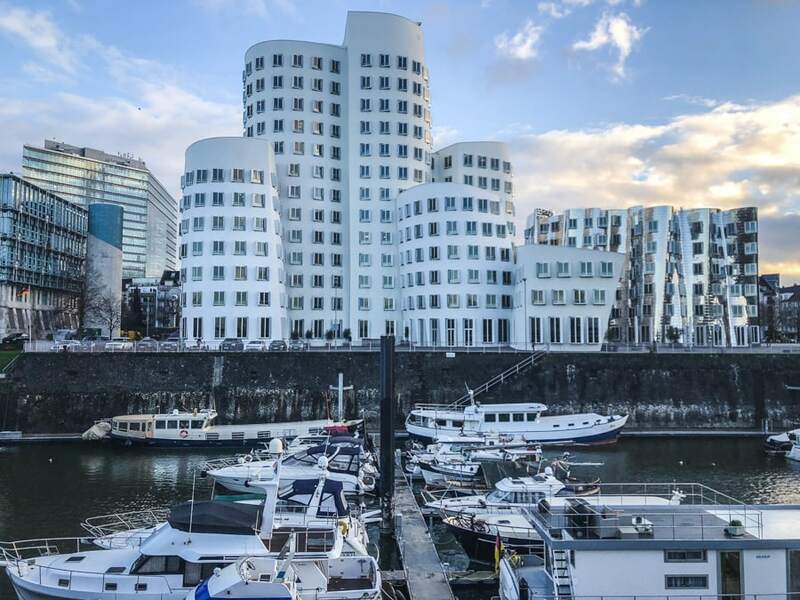 The Rheinhafen Center of the Arts and Media is located at the harbor and the three buildings were built to look like one structure. They are truly architectural wonders and are a must-see for anyone visiting Dusseldorf. When the sun hits the buildings just right, it makes the entire harbor glow. They were built in 1999. You can locate them at Neuer Zollhof 1-3. Kiefernstraße is street in Flingern-Sud that was historically known for squatting and its anarchist atmosphere. 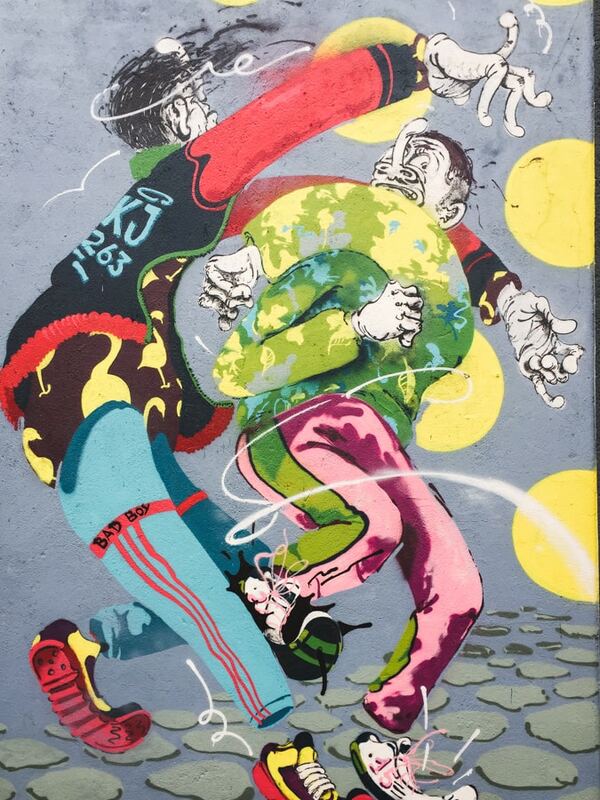 Today, it is a haven for street art. Most tourists head toward the river when in Dusseldorf but rarely head the other way behind the main train station, where Kiefernstraße is located. 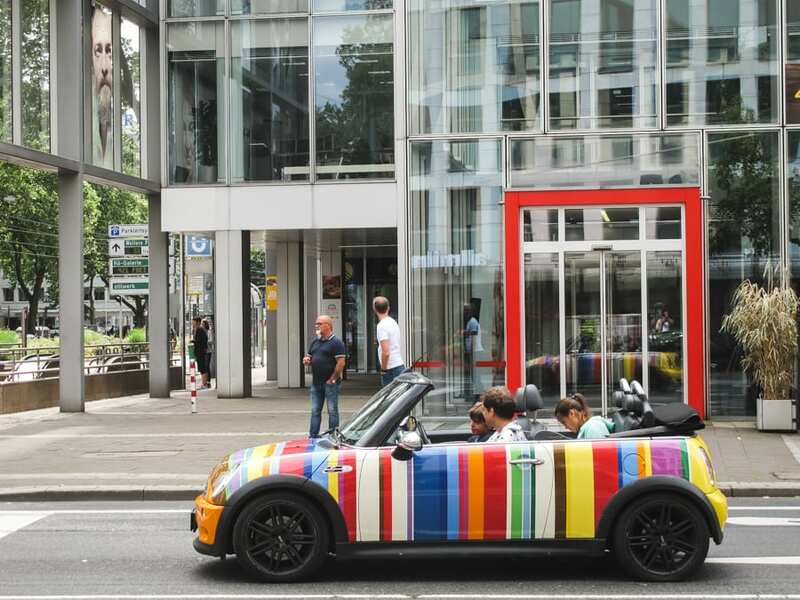 The street art is ever-changing and definitely a place to check out for those looking for a bit more ‘color’ on their trip to Dusseldorf. Dusseldorf is the fashion capital of Germany and nowhere in the country is as fashionable as Konigsallee. You will find locals dressed to the nines walking down this street. There is an array of different high-end stores on Konigsallee but you will also find your standard shops like H&M, Zara, etc. Several events are also held on the street throughout the year like Christmas markets and concerts. This street is one of the main Dusseldorf attractions. If you’re walking around Dusseldorf, you will inevitably end up in Hofgarten, a large inner-city park. The park offers refuge from the chaos of the city and is actually Germany’s first and oldest public park. 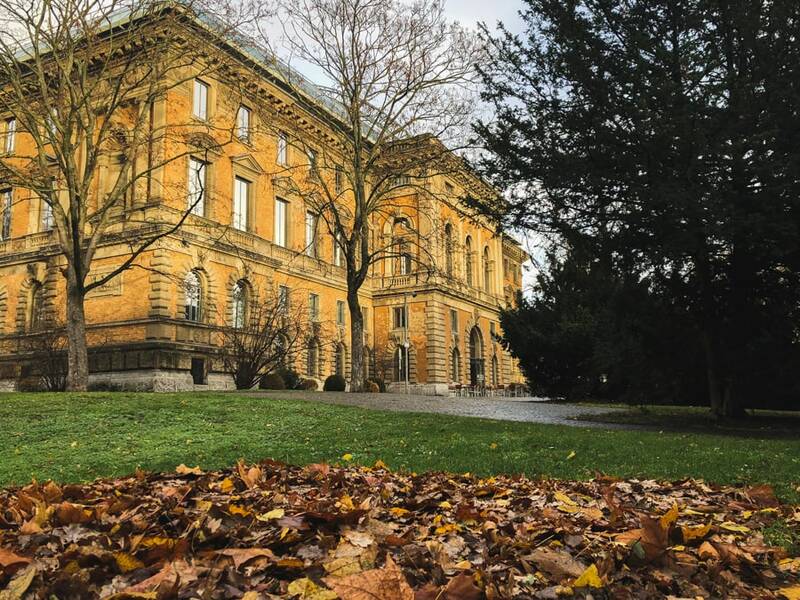 There are a variety of birds calling the park home and inside you will also find Schloss Jägerhof, a building that was once home to a prince. It was damaged during WW2 and rebuilt. You can find Hofgarten in the vicinity of Pempelfort, Stadtmitte, Heinrich-Heine-Allee, etc. I’ll be the first to admit that I love botanical gardens. I often find them all the same but I don’t even care. Especially when I am in Europe and weather can be less than desirable for much of the year. 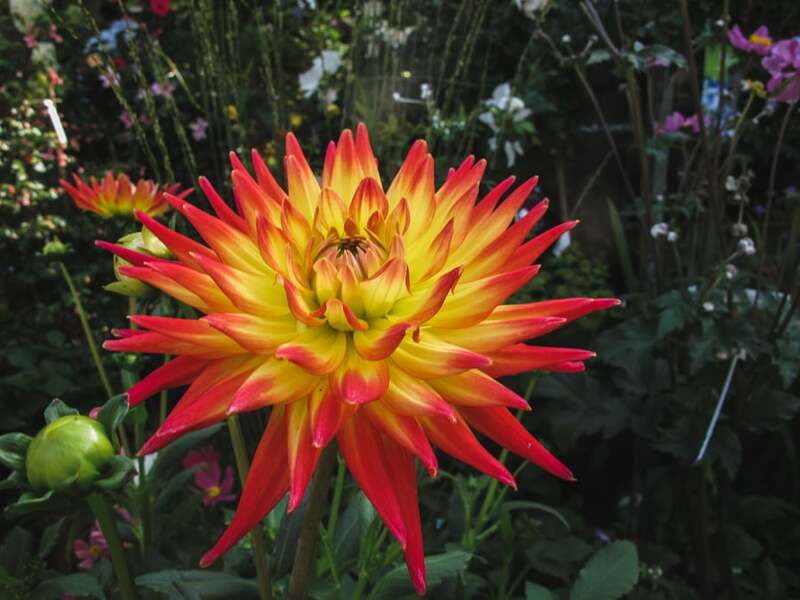 Those few visits to the gardens, even in nicer weather, can help me stay revitalized and energetic for weeks after. The Dusseldorf Botanical Gardens are no exception. The gardens are maintained by the University of Dusseldorf and contain over 6000 species with temperate plants being a focal point. The best part? It is free to visit. Definitely add the Dusseldorf Botanical Gardens to your list of free things to do in Dusseldorf. You can find them at Universitätsstraße 1. 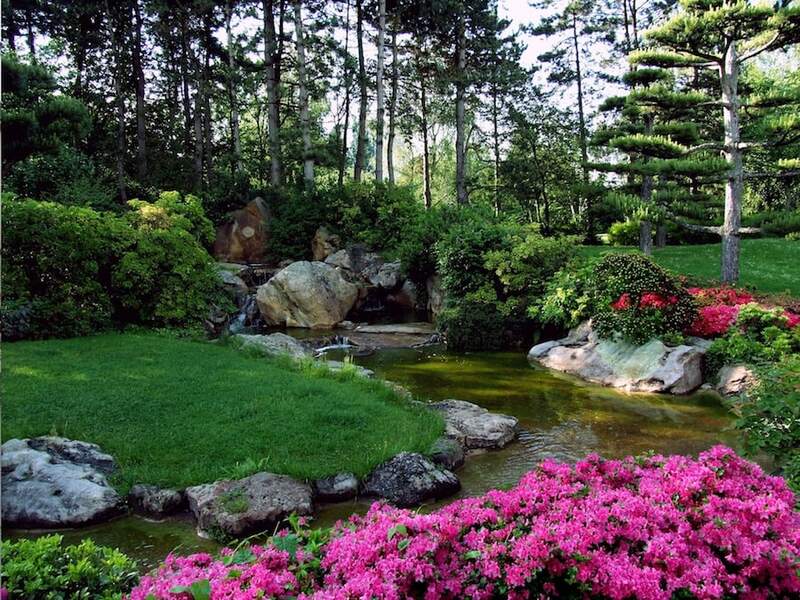 In the northwest corner of the popular Nordpark in Dusseldorf, one will find the Japanese gardens. These 5000 square-meter gardens are located in the quietest part of the park and offer visitors solace and peace in the middle of one of Germany’s biggest cities. Designed by Iwaki Ishiguro and his son, the Japanese Gardens on the Rhine are an essential thing to do in Dusseldorf as it brings together the German and Japanese cultures and signifies the importance of Japan to Dusseldorf. You can find the Japanese Gardens at Stockumer Kirchstraße/ Rotterdamer Straße in Nordpark in Dusseldorf. 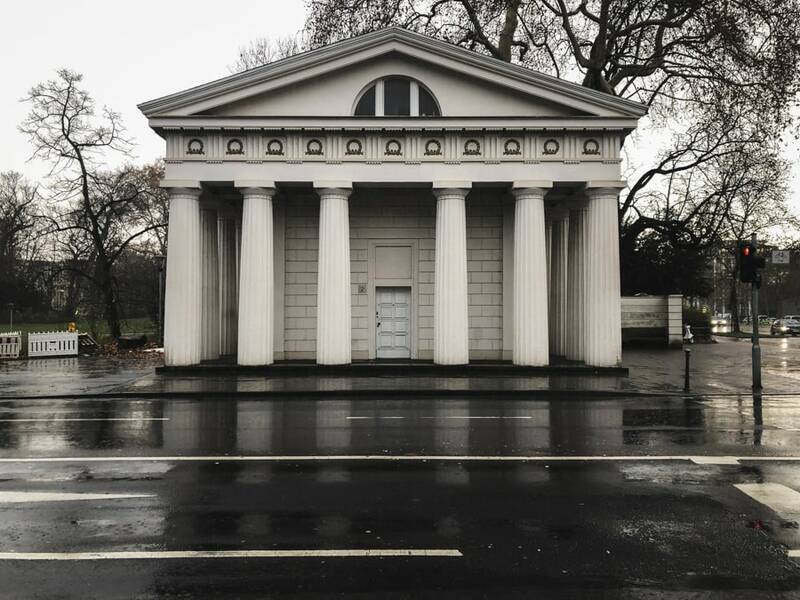 The only standing gate in existence in Dusseldorf, the Ratinger Tor, is still in good condition today. It was built between 1811 and 1815 in a classicist style. Interestingly enough, the two buildings that are the ‘gates’ are in different districts of Dusseldorf. One is in Stadtmitte and the other is in Pempelfort, despite being across the street from one another. When I visited the gate, it was pouring down rain and it offered a nice awning from the crappy weather. You can find it at Maximilian-Weyhe-Allee 1 and 2. 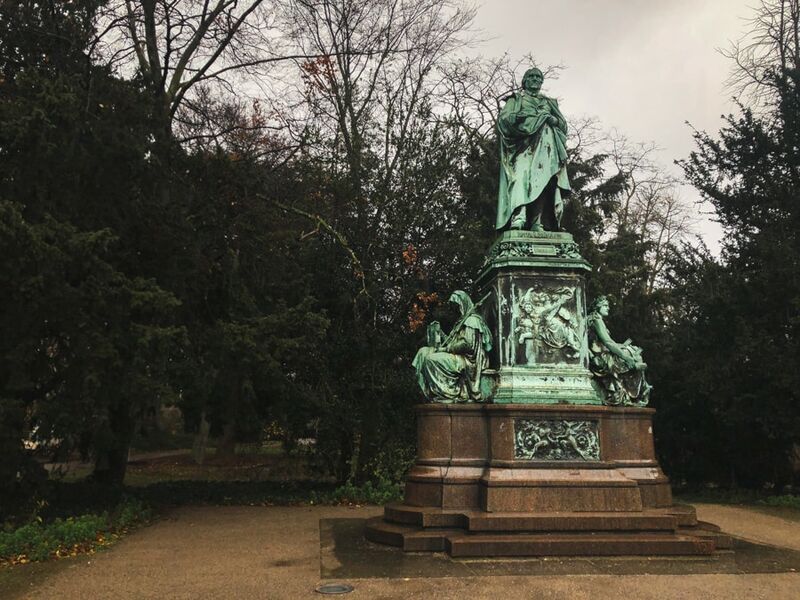 This monument is located in the city center of Dusseldorf and it represents important parts of the history of the city. It is fairly large but easy to miss if you’re not keeping an eye out for it. You can see symbols from the battle at Worringen to symbols showcasing the rivalry of nearby Cologne. It’s a rather interesting piece for history lovers as they will see how dynamic the city’s history truly is. Definitely a must-see for those that visit Dusseldorf. Dusseldorf has the third largest population of Japanese in Europe (after London and Paris). On Immermanstrasse street, you will find Japanese restaurant after Japanese restaurant and loads of shops and hotels. Many menus will be in Japanese as the main language. 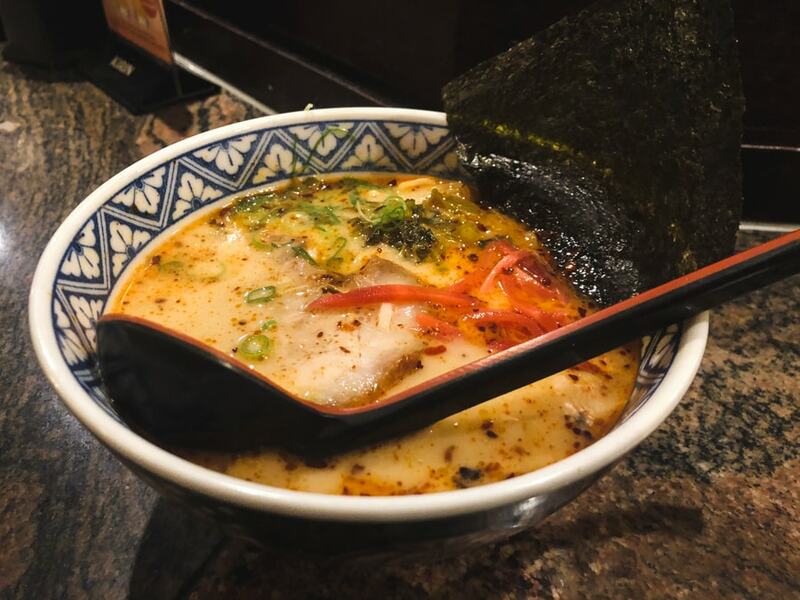 Some of the most popular restaurants are Kushi-Tei and Takumi (which is actually a chain from Japan). You can even find regional ramen on Immermanstrasse. 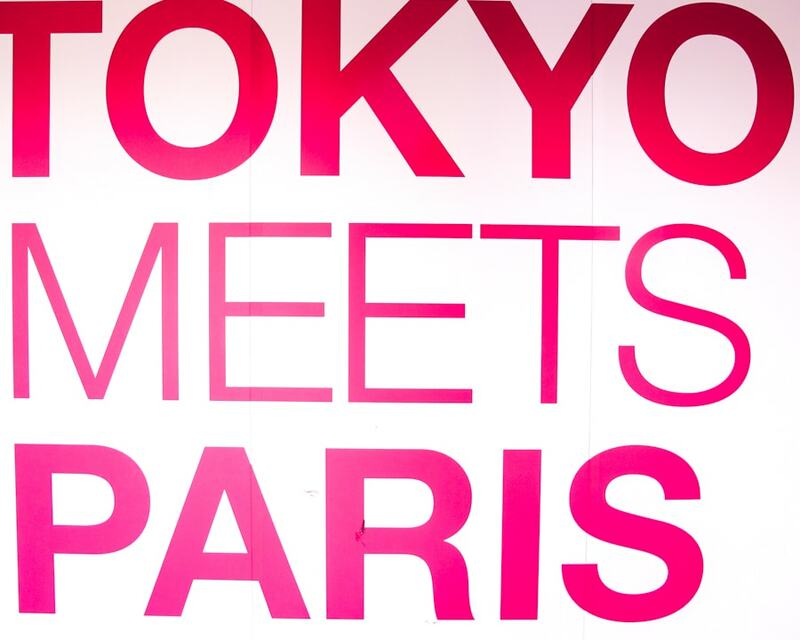 It will make you feel like you’ve left Germany and traveled to Tokyo. One of my favorite discoveries in 2017 was Lina’s Coffee, a cafe in Dusseldorf that was as delicious as it was aesthetically pleasing. I stumbled upon the establishment while in desperation for wifi so I could work as I awaited my flight to the US from Dusseldorf. 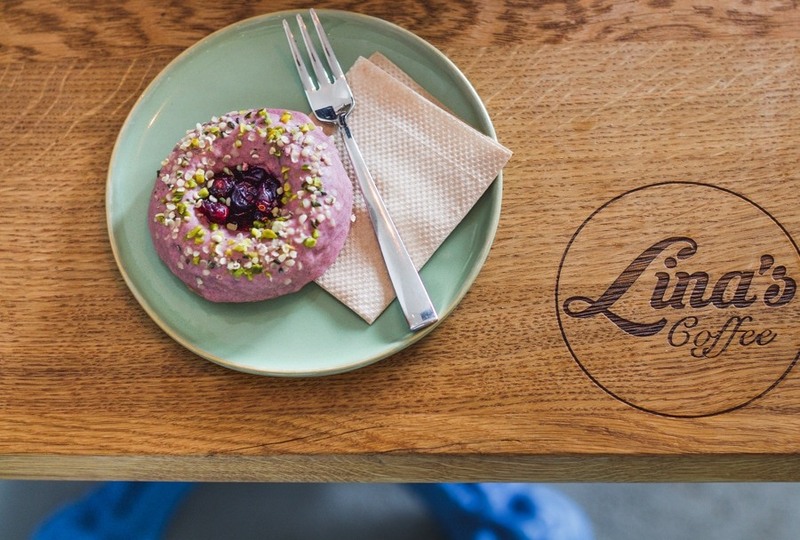 They had amazing coffee, salads, juice, but most importantly- healthy doughnuts. I wasted no time consuming multiple. I definitely recommend heading to Lina’s Coffee when you’re visiting Dusseldorf for one and you can thank me later. You can find Lina’s Coffee at Fürstenpl. 1. Altbier is exclusive to Dusseldorf and it is a must-try when in the city for beer lovers. 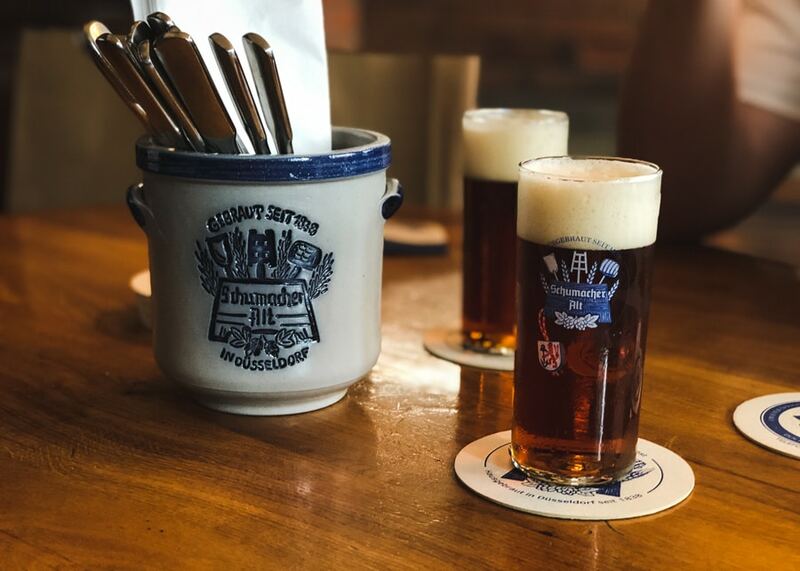 You can enjoy the oldest altbier at Brewery Schumacher, a brewery that dates back to 1838 and is still brewed to the original family recipe. Brewery Schumacher is large, serves traditional German food, and has a massive terrace hidden out back. Tip: Never, ever, ever, ever mention that you like Kolsch better when in Dusseldorf (which I don’t, so that is not a problem). 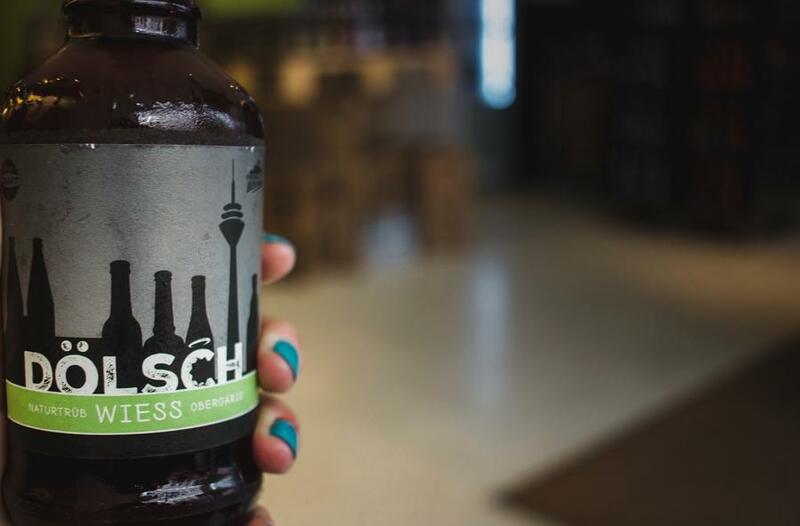 Kolsch is the beer exclusive to Cologne. You can mention that Hamburg beer rocks. You can mention that Berlin beer rocks. But never ever say Kolsch rocks. City rivalries are real and can be taken quite seriously when it comes to beverages in Germany. You can find Brewery Schumacher at Oststraße 123. 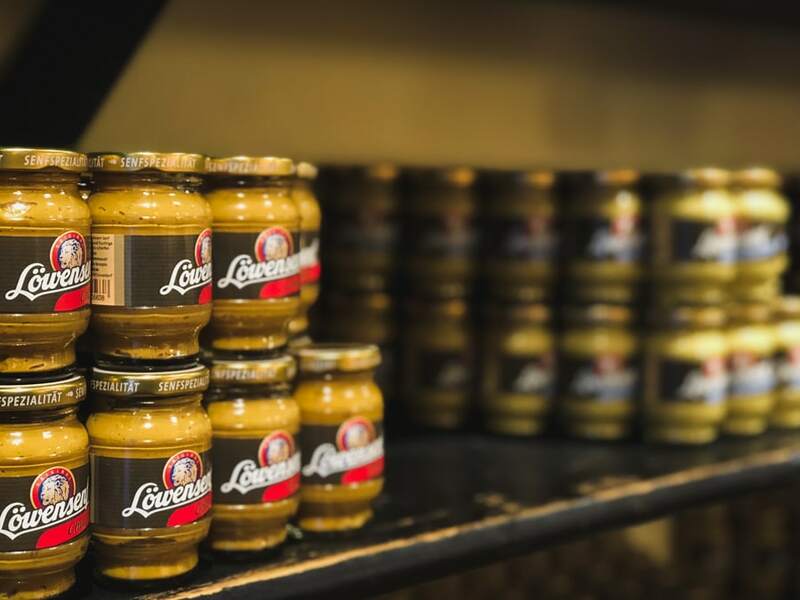 Germans love their mustard and are very proud of it. At the Dusseldorfer Senfladen, you can buy, taste, and learn about German mustard. There is even a small museum inside of the shop showcasing the history of the famous condiment. There is also a tasting station and all mustards are affordably priced. The mustards all have a variety of flavors from chili to dill to garlic. 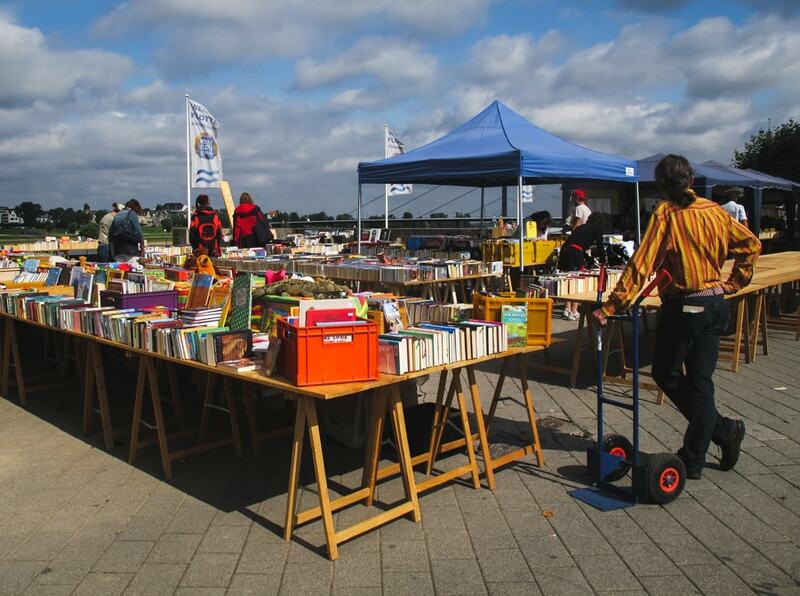 You can put the Dusseldorfer Senfladen on your list of Dusseldorf things to do and visit at Berger Str. 29. Beer lovers have altbier and spirits lovers have Killepitsch. Killepitsch is a Dusseldorf liqueur that is blood red and made from local herbs and berries. It remains very exclusive to the city and you can only buy it in very few places. 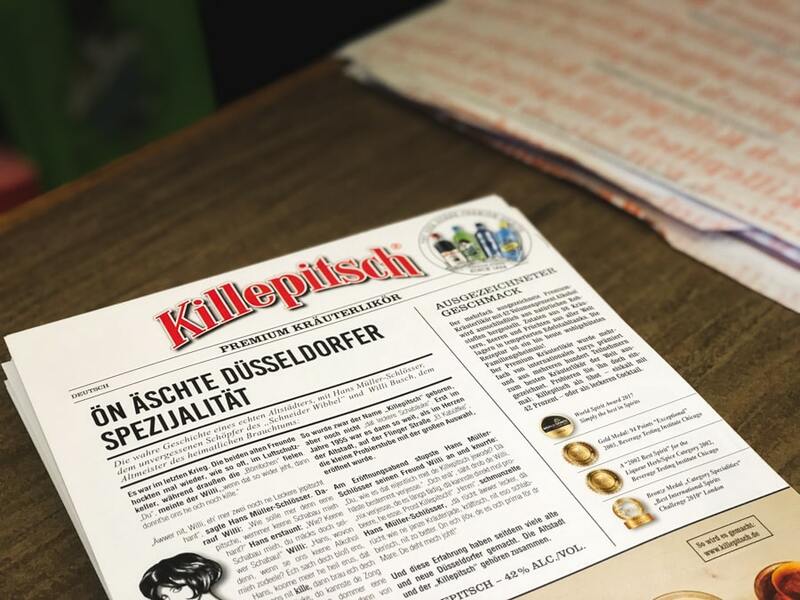 Check out the Killepitsch shop on Flingern called Killepitschstube where they sell it and can inform you all about it. It is their specialty. Location: Flingernstr 1. WOYTON is Dusseldorf’s coffee and it is really delicious. They have been roasting and proudly serving the residents of Dusseldorf since 1998 and you can enjoy their beans and coffee at one of their several locations throughout the city. To be fair, Dusseldorf’s coffee scene has become pretty decent over the years. 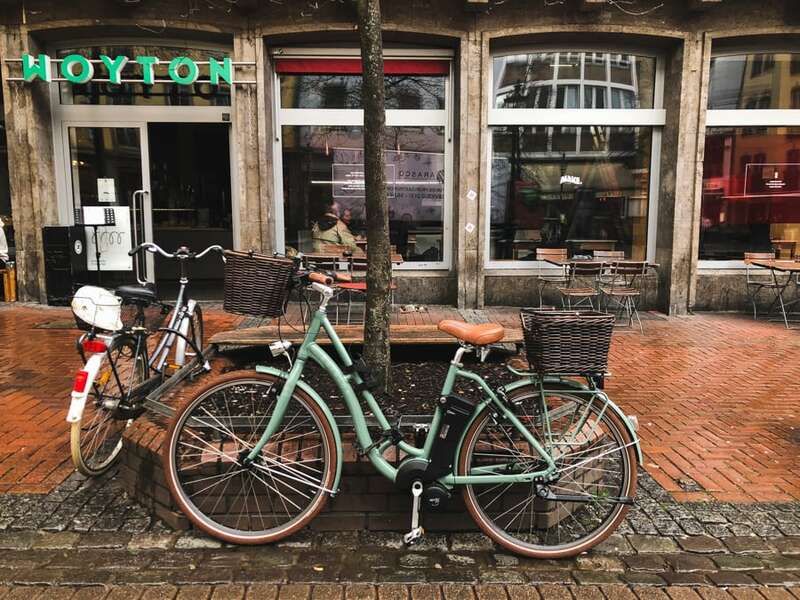 WOYTON was the mothership of it all… but their presence in Dusseldorf has led to a recent boom in specialty coffee shops or places taking pride in their offerings. I love coffee in Frankfurt but it is always nice to know that when I leave my home in FFM that I can find a decent cup elsewhere. Christmas markets are all the rage in Germany and attract tourists from all over the world… but it is the small, hidden ones that the locals love most. 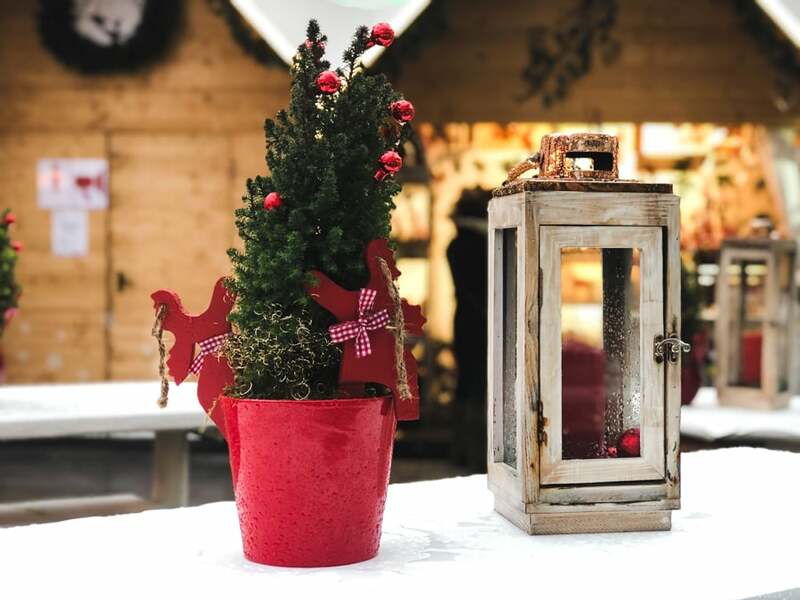 The Christmas market at Schadowplatz is Scandinavian-inspired and is a little cozier than the rest. There are wooden huts that you can sit inside of and drink your gluhwein with friends. The décor of the market is very white and minimalistic, reminiscent to that of Scandinavia. Dusseldorf Christmas markets are a must see if you’re in the city during the holidays! 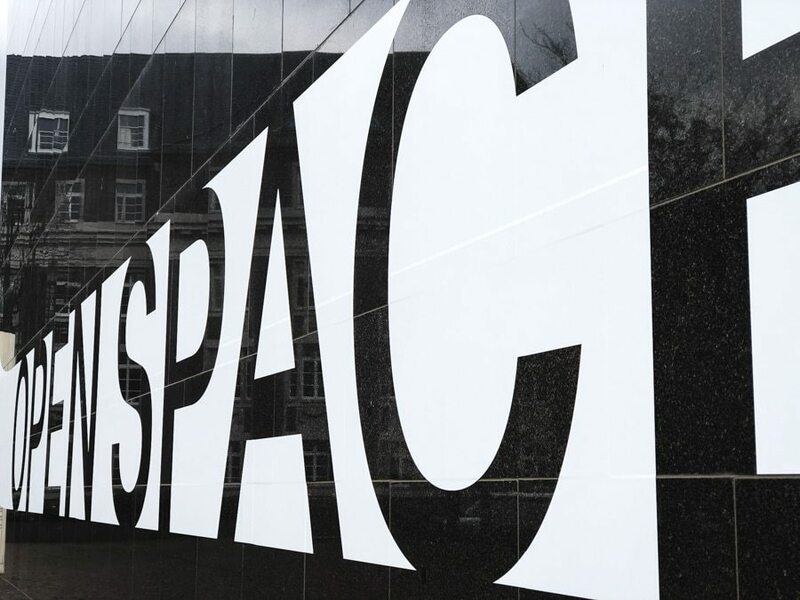 In the heart of Dusseldorf, you will find Carlsplatz. Shops and eateries surround this square, but the real gem is the market that is permanently situated in the middle of it. 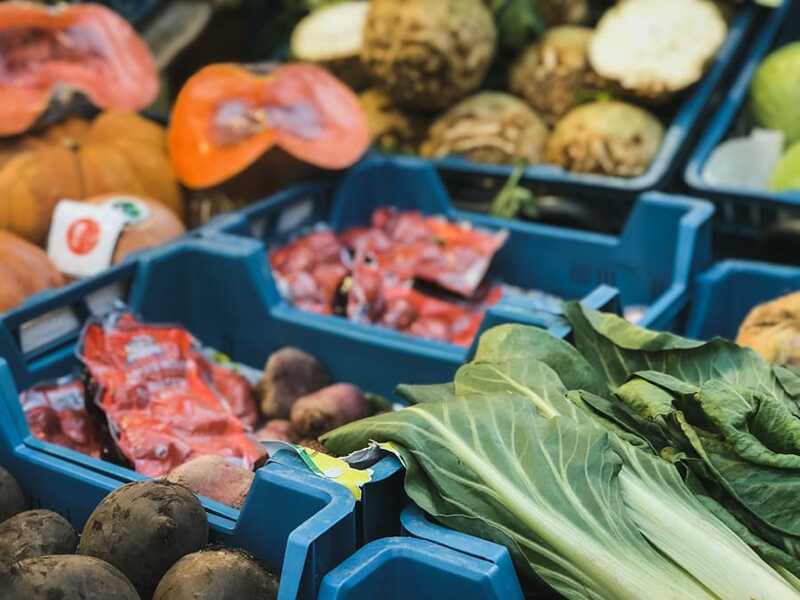 There are produce stands, coffee shops, and small places to eat inside of it. It is very cozy and many of the stands have heating or can be closed off from the outside. There are even small wine bars inside of the covered market! Hanging around Carlsplatz is one of the coolest things to do in Dusseldorf. I first discovered Greentrees back in 2016. I have been there nearly everytime I have been in Dusseldorf since. 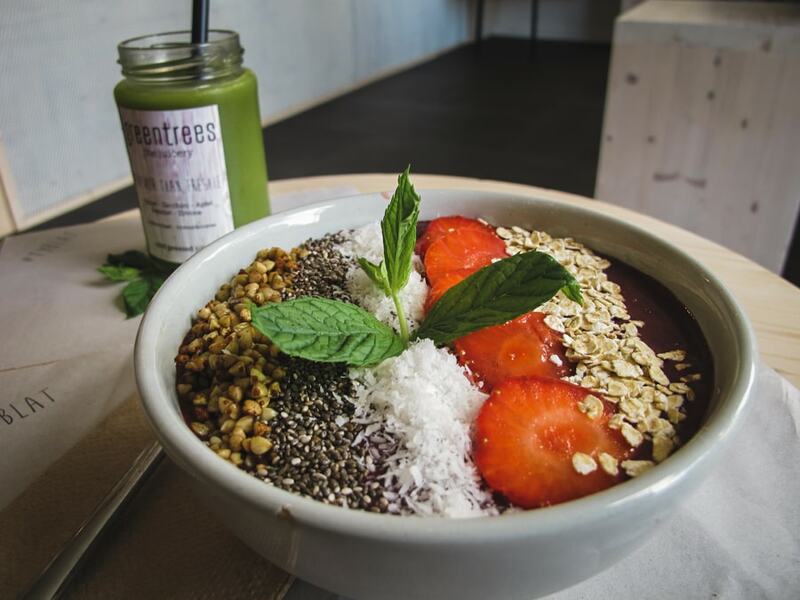 They offer cold-pressed juices, smoothie bowls, and amazing avocado toast. The owner, Alex Greentree hails from Australia and wanted to bring a bit of her homeland’s health-conscious attitude with her. 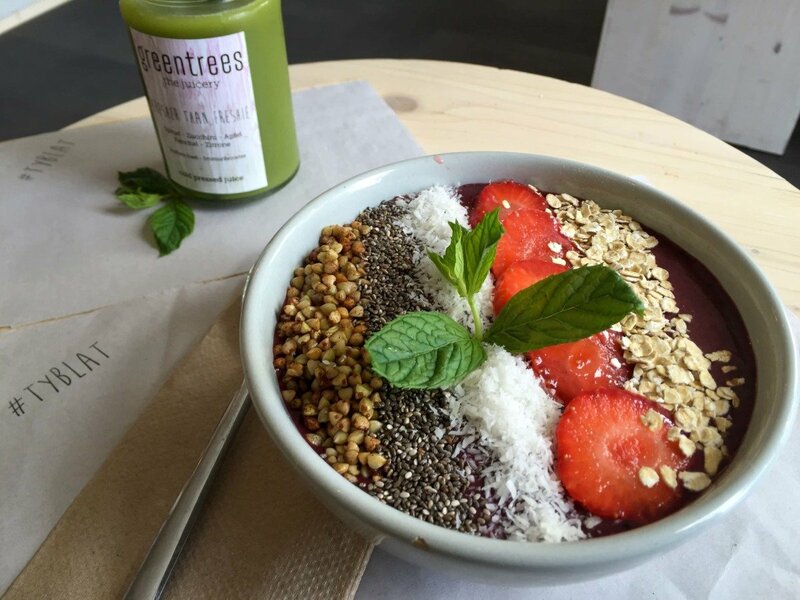 Greentrees is a Dusseldorf must… and they even opened another location in recent years. You can find them at Münsterstraße 149 and Lorettostraße 54. Like most German cities, Dusseldorf has a nice, little craft beer scene. Germany tends to be home to what I call ‘beer loyalists’, or people who don’t venture outside of what they grew up with and know, but the younger generations are slowly embracing craft beer and the small and modern independent brewers emerging throughout the country. There are a few places where you can enjoy craft beer in Dusseldorf, but my favorite is Holy Craft. They began as a store in 2015 and have since opened up an actual bar, serving 12 beers on draft and more than 80 bottled. I found beers at Holy Craft I haven’t seen anywhere else in Germany, and that alone is reason for me to continuously return there. You can find Holy Craft Bottle Shop at Friedrichstraße 79 and the bar at Liefergasse 11. Heading to Frankfurt? Here is my Frankfurt craft beer guide. 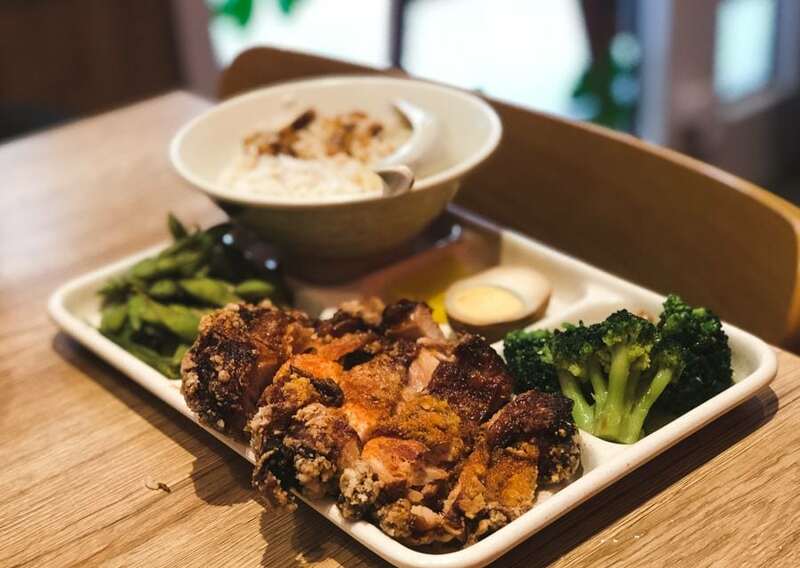 Dusseldorf may be synonymous with Japanese food but rest assured, you can find pretty much delicious food anywhere in the city. My friend, Grace, at Nyonya Cooking recommended me to go to Fuyu, a Taiwanese restaurant on Immermanstrasse that was mind-blowingly good. I have no idea what exactly I ate there, to be fair, but it was all bursting with flavor and making me contemplate that move to Dusseldorf (that inevitably never happened). 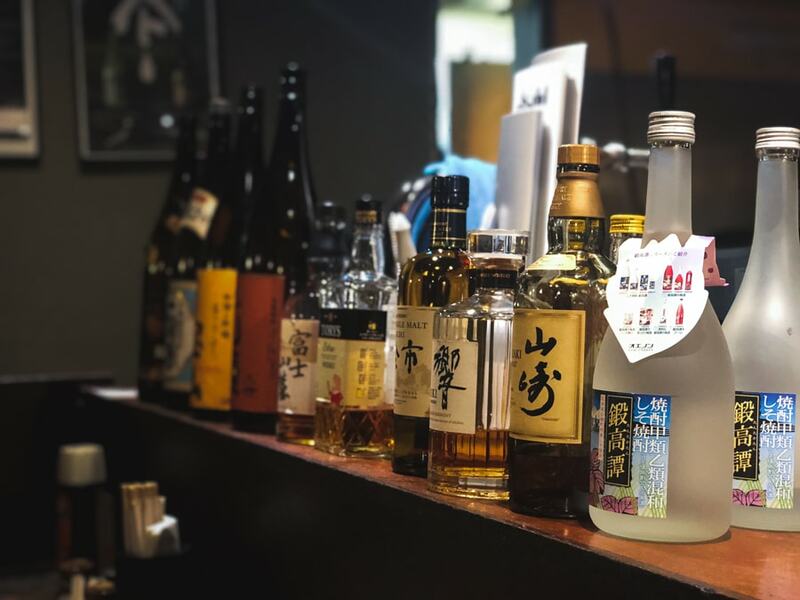 You may not be able to travel to Taipei, but you can come close by visiting Fuyu in Dusseldorf. To find out more information, you can check out their Facebook page or visit them at Immermannstraße 46. Screw it- order anything from there. It is all good. I have had coffee there a few times but nothing beats that day I wanted something different and discovered their hot chocolate. Delicious. 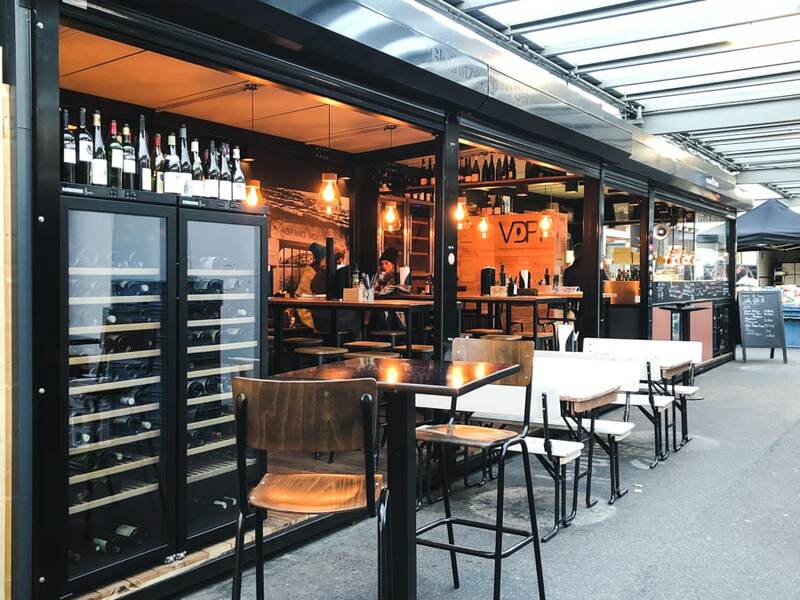 Mr. Ben’s Cafe is located right in the middle of the shopping area in Stadtmitte and it is housed inside of strategically placed shipping containers. I just love it. 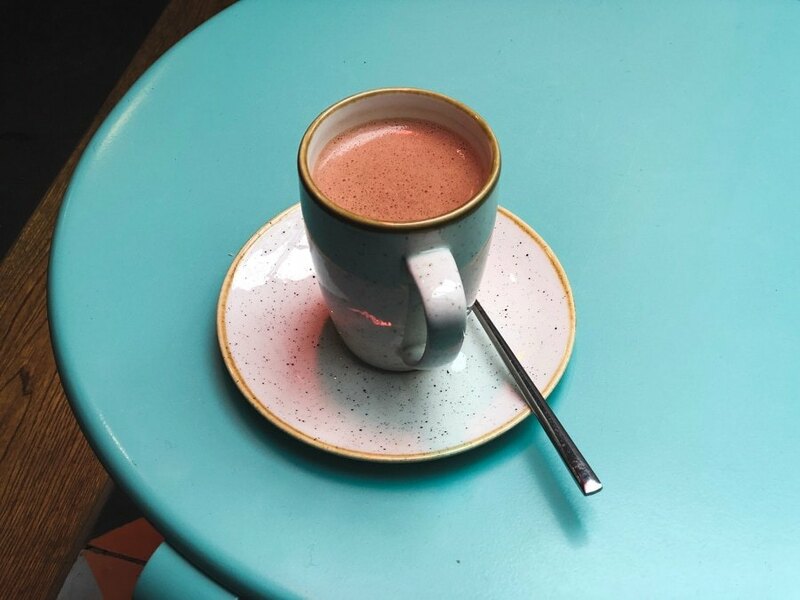 There is a small area outside of it where you can enjoy the warm weather… but if you are like me and travel when weather is hellish, you’ll want to sit inside and sip on a hot chocolate. You can find Mr. Ben’s Cafe at Schadowstraße 41. 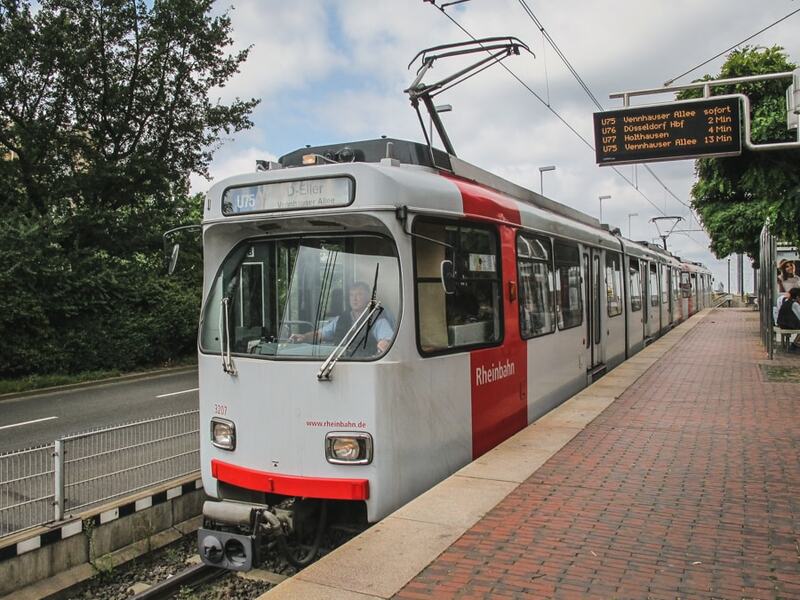 A 20-minute train ride from Dusseldorf is the city of Wuppertal. The city is relatively unknown to most people but is actually home to the world’s oldest suspension railway. It has been in operation since 1901. 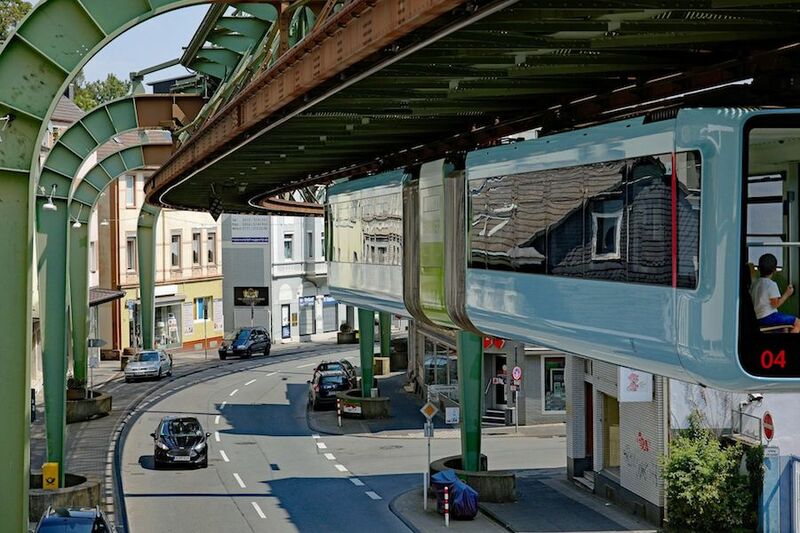 The locals refer to it as Wuppertaler Schwebebahn and it is now the regular means of public transport for the city, carrying around 25 million passengers annually (and 82,000 daily). Close to Dusseldorf is the borough of Benrath. Benrath is home to a very well-known, Baroque-style palace called Schloss Benrath. It’s such a renowned piece of Dusseldorf property that it has even been proposed for the UNESCO World Heritage list. 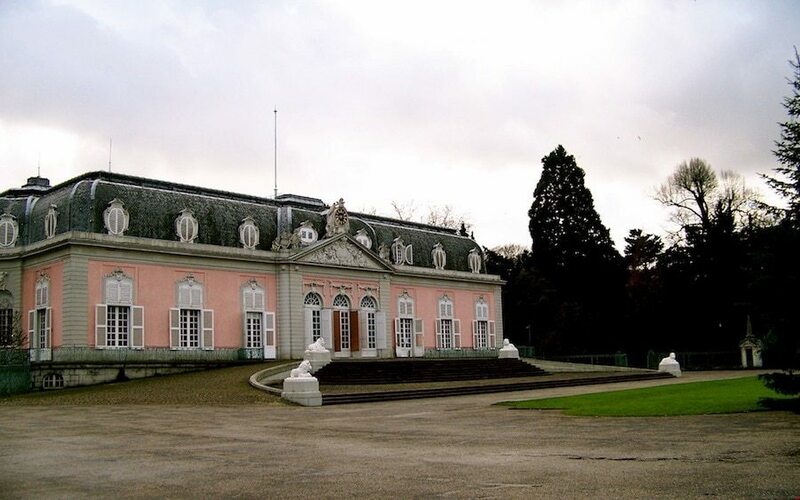 Completed in 1770, Schloss Benrath was built for Elector Palatine and his wife. The property is surrounded by a very large, Baroque-style hunting ground. You can visit Schloss Benrath at Benrather Schloßallee 100-108. Uh oh, suggesting this may get me in trouble with Dusseldorfers, but I think taking a day trip to Cologne will really give you an idea of how special and unique Dusseldorf really is. The rival cities are so drastically different and the perspective is truly put in place when you can see Cologne. Cologne is fun and wild- I love it. And while Dusseldorf has its own nightlife and party scene, I think what really shines about the city is how organized and pretty it is. Without going to Cologne, you may not appreciate this. Aside from the comparison factor… Cologne is a blast. It is easily one of my favorite German cities. It is a party. 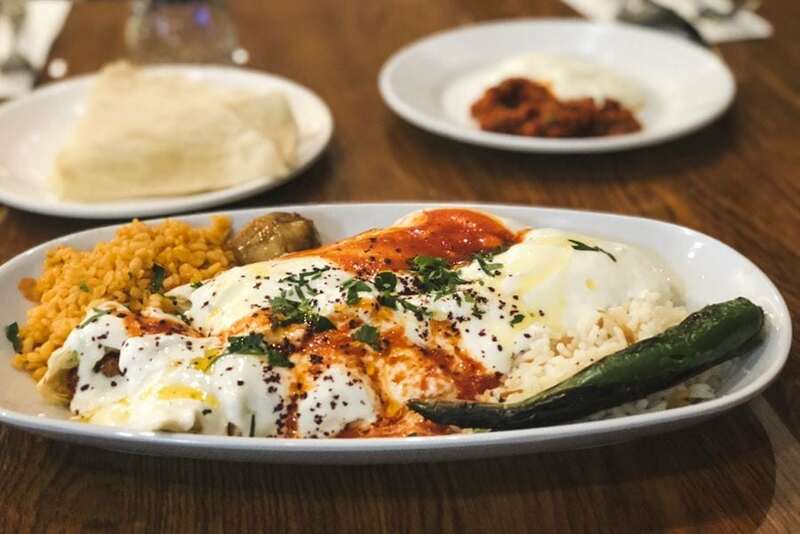 And it has some of the best Turkish food I have ever eaten in my life. The best thing is that the cities are only a short train ride or bus ride from one another. Germany is known for its massive TV towers that grace the skylines of most cities. Dusseldorf’s is especially notable because it is one of the few that you can actually go up in. Take an elevator to the top and witness Dusseldorf from above. There is a café and restaurant at the top so you can order a drink and food while you sit atop the city. It also offers a view of the Rhein River, one of the most historically important rivers in the world. There is a fee to visit. I believe I paid about 9 Euros to visit (prices are subject to change). You can locate the Rheinturm at Stromstraße 20 along the Rhein. Dusseldorf is pretty. I reckon that it is overall Germany’s most aesthetically beautiful city (sorry Dresden… you’re up there too!) The streets are clean and cobbled and the buildings are just so delicate and well-constructed. You surely don’t find this in Frankfurt. But the coolest thing about Dusseldorf is just casually strolling the streets and districts with no agenda and taking it all in. Some of the best streets are around Carlsplatz and you can enter them from the Rhein River area. I hate comparing cities on a grand scale, but Dusseldorf’s architecture reminds me of a mashup of Amsterdam, London, and various places in France. I just love it. And I think you will too. Dusseldorf’s transportation system is a lot better than other cities (cough, cough… Cologne) and it is extremely easy to navigate. Another thing I like about it is that one ticket generally covers all stops and stations on the VRR (Verkehrsverbund Rhein-Ruhr). I am often intimidated by public transport in cities, but never Dusseldorf. Sometimes I like taking the train across the Rhein and discovering a different world that I wouldn’t have known existed otherwise. I suggest you do the same. 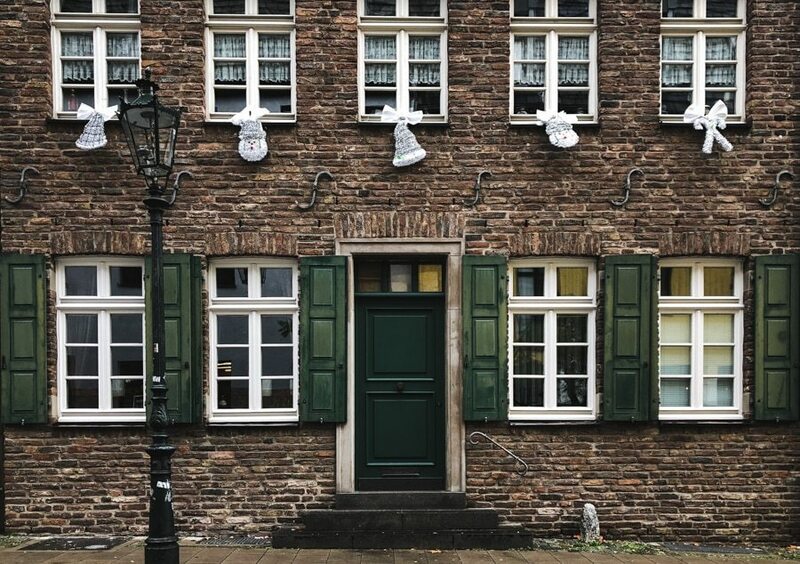 One of Dusseldorf’s most charming streets is Muhlen Gasse. It is quiet and tucked away from the touristy old town and still exudes the same appeal and old school demeanor. The street is short and filled with photogenic buildings dating back to the 1600s. There are also some art galleries, cafes, and restaurants dotting the street. If you’re looking for something a bit more off-the-path when visiting Dusseldorf, be sure to take a stroll down this street. The Rhein River (Rhine River) is one of the most historically important rivers or bodies of water in the world. 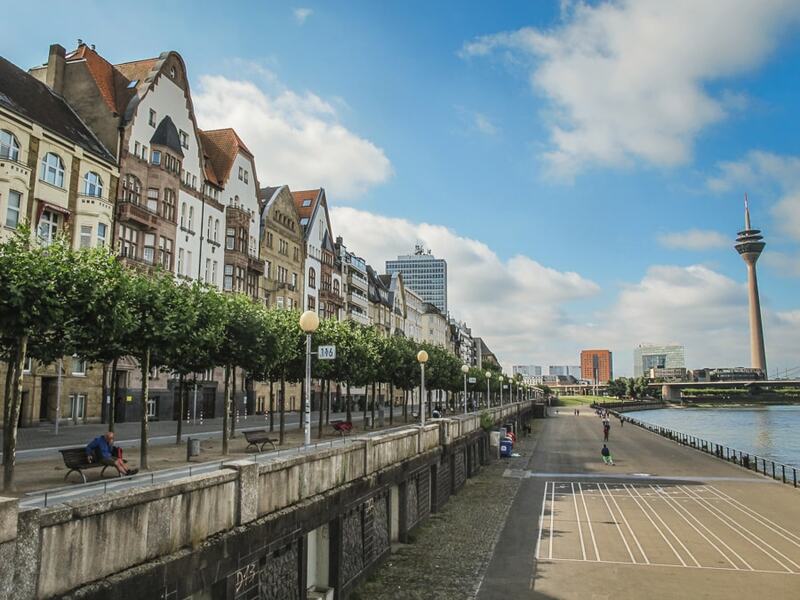 And in Dusseldorf, you can walk along the river and explore its beauty and size firsthand. The promenade runs for a long distance and on weekends and during certain times of the year, there will be markets and events hosted in the area. There are cafes, restaurants, and artwork, as well. If you do one thing while in Dusseldorf, be sure to head directly to the Rhein and take in its allure. It is a must. 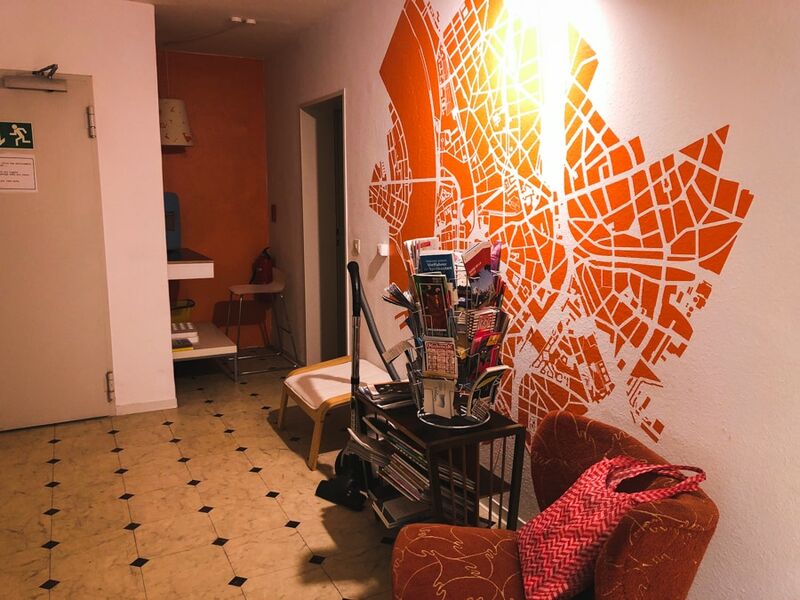 I stayed at this hostel/guesthouse the last time I was in Dusseldorf. I loved it! I had my own room and to my surprise- it was huge! I had a terrace, sink, desk, etc. It was really an amazing space and for a fair price. 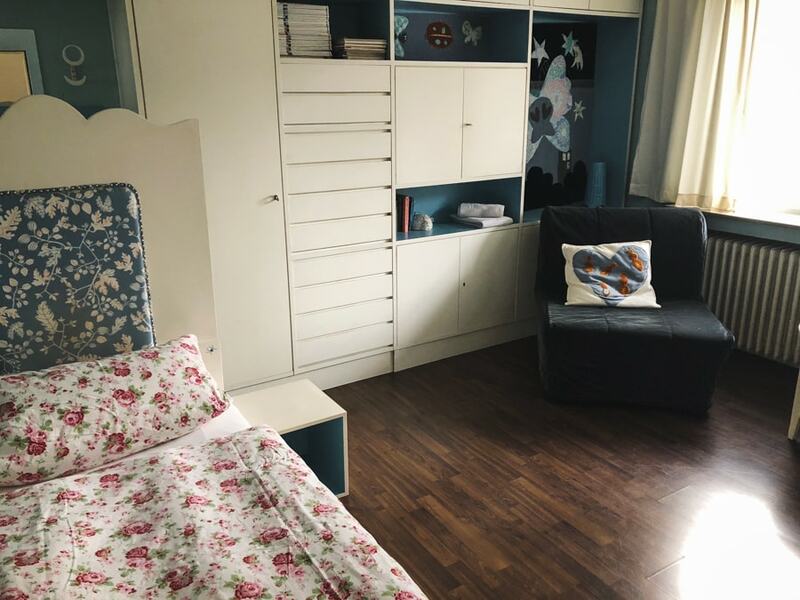 I went during winter and ended up with the entire apartment to myself… I kind of regret going out and partying and not getting a chance to enjoy the place more! 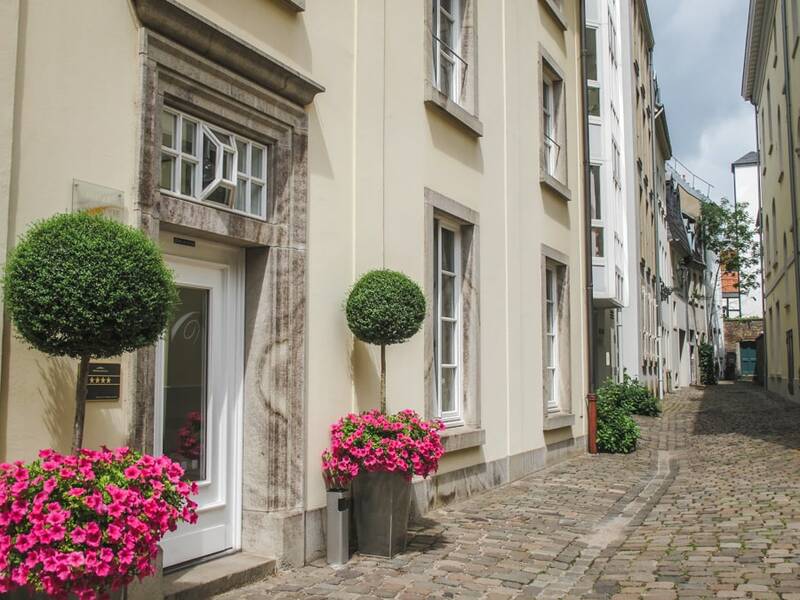 This hotel is located in Dusseldorf’s Friedrichstadt district and is a very no-frills, yet comfortable place to stay while in the city. The amenities are extensive and they offer a delicious breakfast. It is also located very close to public transport which can take you throughout the city with ease. Dusseldorf is a great city for a city break. It is easy to get to by train, air (three airports service the area, including Cologne/Bonn), or car. 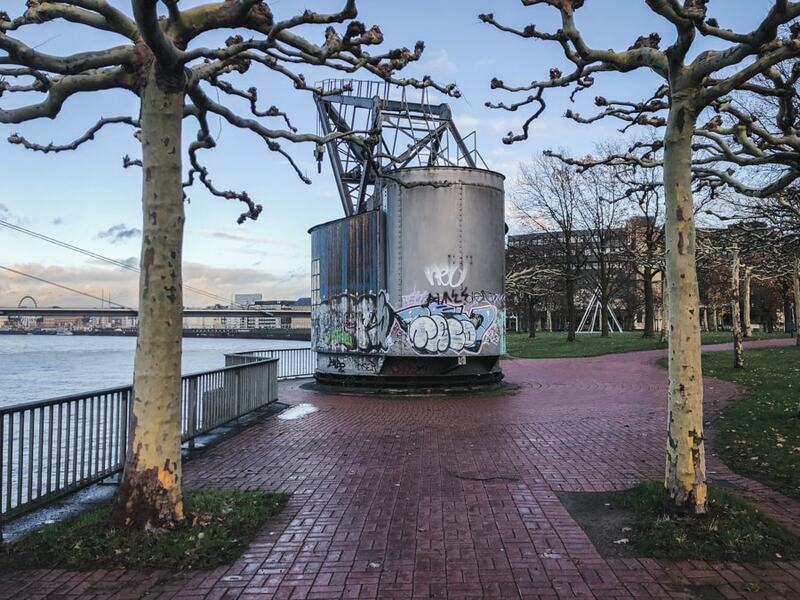 These things to do in Dusseldorf will give you an idea of how to get started with the city and it is up to you to explore the rest on your own. If there are any further suggestions you have of things to do in Dusseldorf- please drop them in the comments so I can check them out on my next trip! Thanks! I can’t believe I’ve never thought of visiting Dusseldorf before reading this post! It looks like such an amazing destination and somewhere that is now firmly on my to-visit list.